Do you plan to live forever? Do you ever plan to move? Depending on where you’re going, you can’t take it with you. What are you going to do when “The one who dies with the most toys… still dies“? Find out what you can do before that time comes! On Wednesday, April 3, noon to 3:00 p.m. Gail Rubin, CT, presents “Kicking The Bucket List: Downsizing and Organizing Things to Do Before You Die.” The event takes place at at the Reston Community Center, 31 Colts Neck Road, Reston, Virginia. Lunch is included for $15/residents, $23/non-residents. Register for class 500779 through this webpage. Approximately 10,000 baby boomers turn 65 every day. They own a lot of stuff and control a lot of money. Eventually, 100% of them will die, leaving their possessions, their financials, and their funeral plans in the hands of their spouse or kids – if they have them. Yet less than 30% of U.S. adults have done any end-of-life planning, that is a problem. This talk focuses on practical ways to downsize excess goods without being overwhelmed by the job, what you need to know to organize your information for your executor, and how to plan for end-of-life issues. Film clips add to the wealth of information in this talk. Gail Rubin, CT, uses humor, funny films and outside-the-box activities to teach about end-of-life issues. 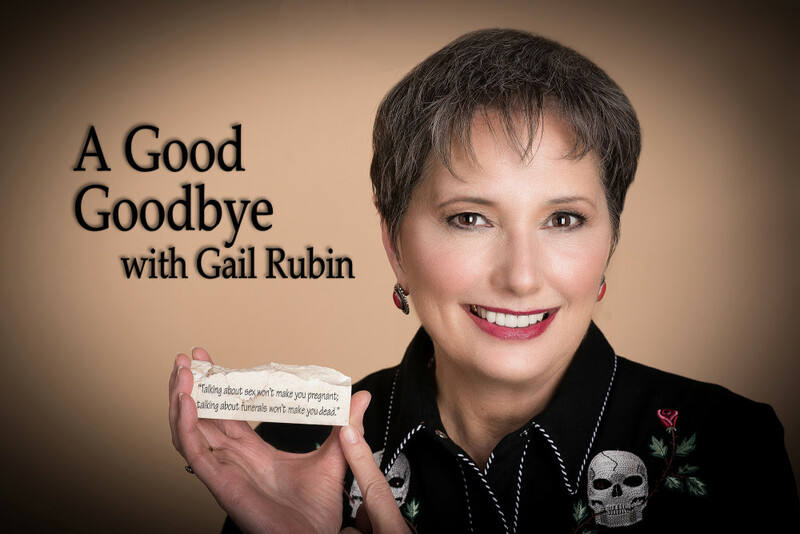 Gail Rubin, CT, is a pioneering death educator who uses humor, funny film clips and outside-the-box activities to teach about end-of-life topics. An award-winning speaker, she “knocked ’em dead” at TEDxABQ in 2015. She’s the author of three books on end-of-life issues: A GOOD GOODBYE: Funeral Planning for Those Who Don’t Plan to Die, HAIL AND FAREWELL: Cremation Ceremonies, Templates and Tips, and KICKING THE BUCKET LIST: 100 Downsizing and Organizing Things to Do Before You Die.